The Friday the 13th documentary “Crystal Lake Memories: The Complete History of Friday The 13th” is currently being filmed for a late 2012 release. A look at Friday the 13th Part 8: Jason Takes Manhattan. 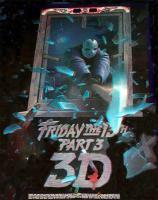 Jason kills on a cruise ship, then visits NYC in the 8th installment of the Friday series. Free screening of The Burning Moon, the underground gorefest by German director Olaf Ittenbach, this Friday, April 13th, 2012 in Miami, Florida. 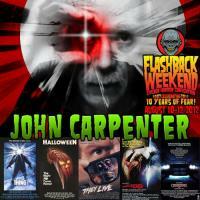 The Hudson Horror Show V in Poughkeepsie, NY is a film festival featuring 5 classic horror films in rare 35mm. In Friday the 13th Part 7: The New Blood, Lar Park-Lincoln channels Carrie, fighting Jason Voorhees during a weekend at Bernie’s. 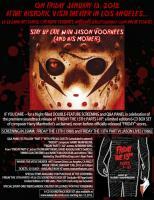 Friday the 13th double screening on January 13, 2012 at Vista Theater to celebrate release of 6 CD soundtrack box set.